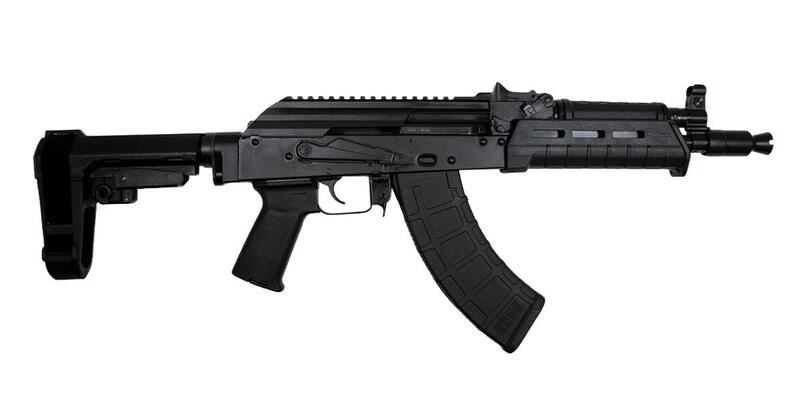 South Carolina-based PSA has a new version of their GF3 series AK set up in a pistol configuration. Dubbed the PSAK-P, it uses a 10.5-inch 4150 steel-treated barrel equipped with a Krink-style muzzle device as well as a hammer forged bolt, carrier, and front trunnion. Using an M4 stock adapter, the pistol ships standard with an installed SBA3 adjustable arm brace. The trigger group on the U.S.-made 7.62x39mm handgun is a single stage, single hook type. The stamped steel receiver has a railed dust cover. In the above video from PSA, Kris Vermillion shows off the basic model AK-P that includes a Magpul handguard, grip, and 30-round PMAG, but says that other variants of the handgun are planned with standard furniture.